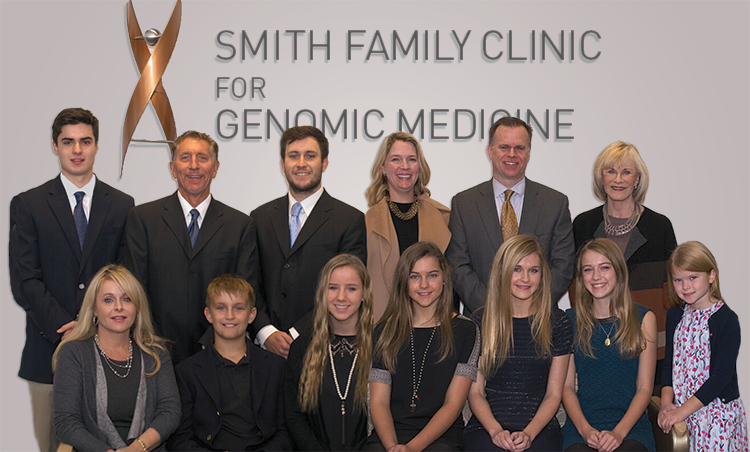 The Smith Family Clinic for Genomic Medicine is named in honor of the Smith Family. Their generous support has made it possible to bring genomic medicine to Huntsville, Alabama and beyond. Mark C. Smith graduated from the Georgia Institute of Technology in 1962 with a B.S. in electrical engineering. He began a career in electronics with SCI in Huntsville, Alabama. He worked there up until 1969, when he put his life savings into starting Universal Data Systems, Inc., Alabama’s first data communications company. The success of this endeavor attracted the attention of Motorola and in 1978, he sold UDS to Motorola and stayed on as vice president of the UDS-Motorola Division. In 1986, Mark and Lonnie McMillian co-founded telecommunications company, Adtran. 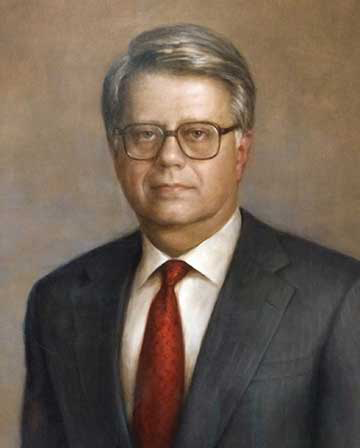 In addition to his many business accomplishments in both Huntsville and throughout the state of Alabama, he was also an active philanthropist in his community. Mark was diagnosed with head and neck cancer in 2000. This trying time in his life contributed to his interest in biotechnology. He signed up for an organic chemistry class at MIT so that he would have an educational background for his involvement with HudsonAlpha Institute for Biotechnology. He was one of the founding board members of the Institute and was on the building committee. Mark died of complications from pneumonia on March 27, 2007. He is survived by his wife, Linda Smith, his daughter Cynthia Smith Hughes, his son Mark Clay Smith and eight grandchildren. Clay Smith serves as the CEO of M.C. Smith Realty (MCSR), a real estate investment company he founded in 2003, that provides opportunities primarily in ground‐updevelopment for his investment partners and family. Clay is also the CEO of Smith Asset Management Company. Established in 2006, Smith Asset Management Company is a family office that manages the capital of the Mark C. Smith family and their affiliates. Heavily involved in the Dallas‐Ft. Worth family office community, Clay established the Family Office Forum (FOF) in 2006. The FOF is a dynamic peer‐to‐peer group with more than 60 family offices that meet regularly to discuss the responsibilities and processes of a typical family office. The establishment of this forum has provided valuable insight and promote excellence in the typical family office environment. Clay received his M.B.A. from Southern Methodist University and his B.S. in business management from The University of Alabama. A strong advocate for education, Clay currently serves on the Board of the Episcopal School of Dallas and the Board of Visitors at the University of Alabama. He is a member of Highland Park United Methodist Church along with his wife, Cameron and their four children. 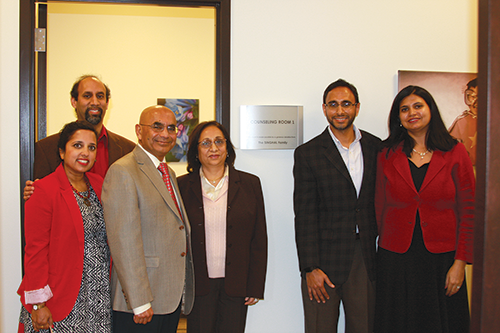 To recognize the Singhal family’s generous gift, one of the clinic’s genetic counseling rooms is named in their honor. Ashok Singhal, PhD, is principal founder and chairman of HudsonAlpha associate company CFD Research Corporation (CFDRC). Singhal’s family is the first to make a donation to support a room in the clinic and it’s mission. The clinic’s mission is not only to help patients and physicians find answers, but also to give patients the best clinical care and a positive medical experience. The Singhal family’s donation will help support the clinic’s work. The HudsonAlpha Foundation has received a $100,000 gift from Ray and Nancy Sheppard to support the Smith Family Clinic for Genomic Medicine. 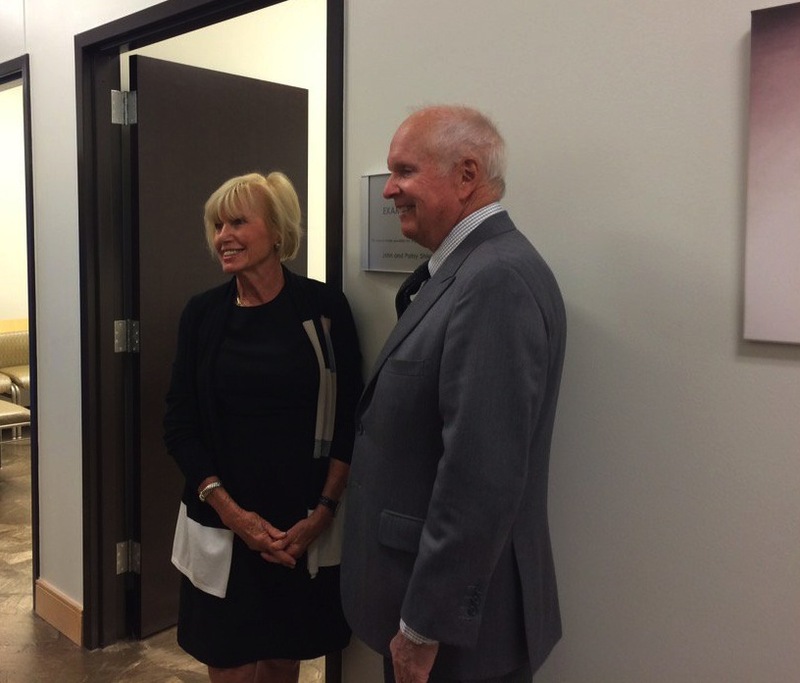 To recognize the Sheppard’s generous gift, Exam Room 1 is named in their honor. Ray Sheppard, MD, is an OB-GYN surgeon and Nancy Sheppard is a registered nurse. They both have a strong interest in helping to advance the practice of medicine in our region. “Of all the endeavors Nancy and I have an opportunity to support, we feel fortunate that we can provide this gift to help our community and to help families,” said Ray. The vision for genomic medicine at the Smith Family Clinic is for whole genome sequencing to become an increasingly valuable tool not only for diagnosis but also for prediction and prevention of disease. This vision is important to the Sheppards. The HudsonAlpha Foundation has received a $50,000 gift from the James Cecil and Margaret G. Ashburn Family Foundation to support The Smith Family Clinic for Genomic Medicine. 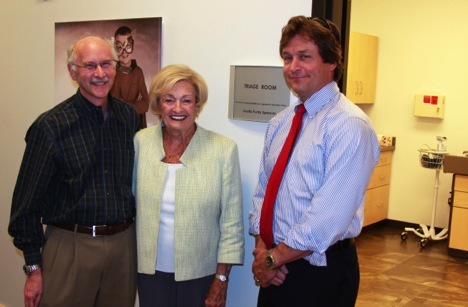 To recognize the foundation’s generous gift, the Check In/Check Out room is named in the Ashburn Family Foundation’s honor. “I know Cecil would be so happy to support the work the Smith Family Clinic is doing to help patients and their families,” said Chris Hinson, an attorney specializing in estate planning who helped Cecil set up the family foundation. Hinson is also an Ashburn Family Foundation board member and a member of HudsonAlpha’s Professional Advisors Council. Cecil Ashburn was born in 1920 and grew up during the Great Depression. He joined the Army right before World War II started. During the war, he learned the road construction trade. After the war, Cecil returned to Huntsville and started his own road building business. His company built many roads during Huntsville’s rapid growth, including U.S. Highway 72 West, most of Memorial Parkway and the runways at Huntsville International Airport. Ashburn set up his family foundation in the 1990s with the intent of helping the local community after his death. Ashburn died in 2012 at the age of 92. The Check In/Check Out room is a private area where office staff meet with patients to go over paperwork and payment information. 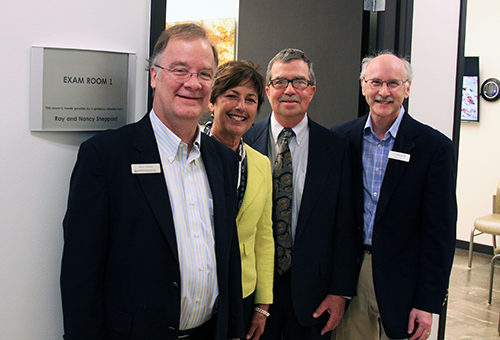 An exam room at the Smith Family Clinic for Genomic Medicine has been named in honor of John and Patsy Shields, longtime supporters of the HudsonAlpha Foundation and the work being done at the Institute. The Shields, who founded Century Auto, have supported HudsonAlpha’s breast and ovarian cancer research for years through the Tie the Ribbons event and the Breakthrough Breast Cancer Fund. Patsy is a breast cancer survivor, making that area of research very important to the family. But their philanthropic passion goes beyond breast and ovarian cancer research. This new gift supports genomic medicine at the Smith Family Clinic. The clinic sees children and adults with rare undiagnosed disease and utilizes whole genome sequencing to diagnose and identify new treatments for those patients. “We are honored to play a part in HudsonAlpha’s efforts to help those struggling with rare and undiagnosed genetic disorders and diseases,” said Patsy Shields. John and Patsy moved to Huntsville in 1969 to open their first car dealership. John retired as the company’s President and CEO in 1993 and was replaced at the helm by his daughter, Tracy Jones. Her husband, George Jones, serves as General Manager. 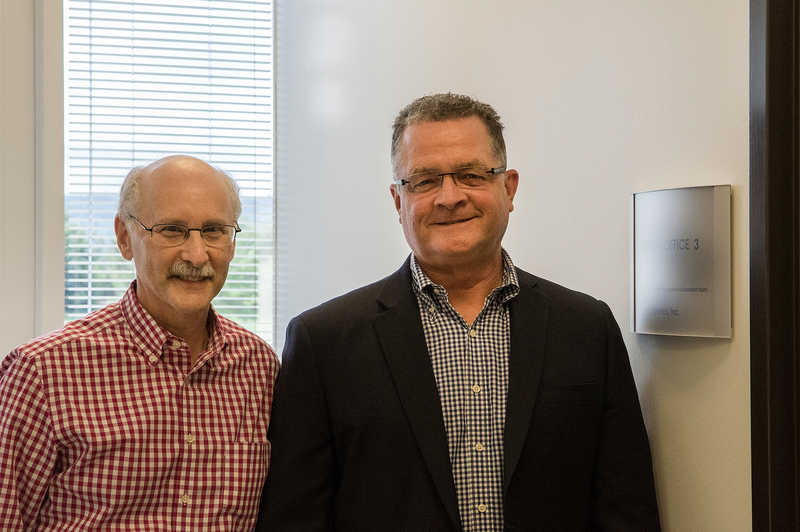 A visiting-physicians office at the Smith Family Clinic for Genomic Medicine has been named in honor of Dynetics, supporter of the HudsonAlpha Foundation. Headquartered in Huntsville, Ala., Dynetics, provides high-tech products and services in an ethical, responsive, and cost-effective fashion to the national security, satellite, launch, automotive, cybersecurity, and critical infrastructure sectors. 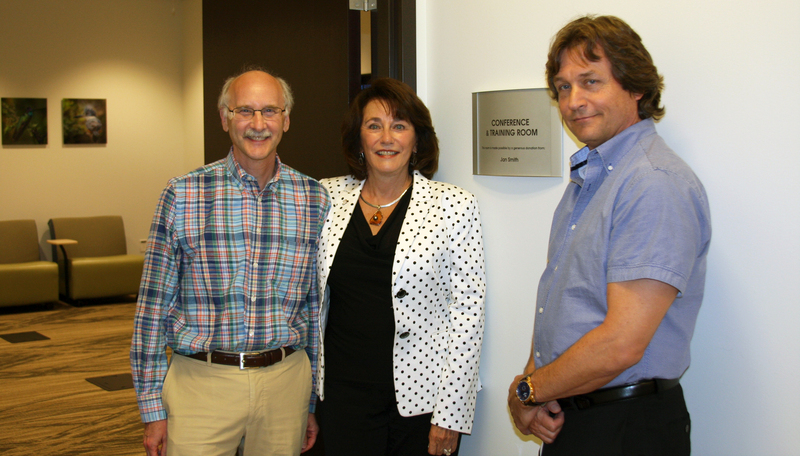 This new gift supports genomic medicine at the Smith Family Clinic. The clinic sees children and adults with rare undiagnosed disease and utilizes whole genome sequencing to diagnose and identify new treatments for those patients. The HudsonAlpha Foundation has received a $100,000 gift from Loretta Spencer to support the Smith Family Clinic for Genomic Medicine. To recognize Spencer’s generous gift, the clinic’s triage room (a room where our doctor meets with and evaluates new patients) is named in her honor. Loretta Spencer served as the mayor of Huntsville, Alabama from 1996 to 2008 and is actively involved in many local nonprofit organizations, including HudsonAlpha Institute for Biotechnology. Spencer was the mayor when HudsonAlpha broke ground in 2005 and she has supported the Institute from the beginning. With her donation, she is expanding her support to include the Smith Family Clinic, the first clinic in the world to use whole genome sequencing exclusively to diagnose rare undiagnosed and misdiagnosed disease. Spencer is excited that the Smith Family Clinic has added yet another unique dimension to Research Park. The triage room at the Smith Family Clinic is a spacious room designed to comfortably accommodate patients and family members on their first visit to the clinic. The room includes wheelchair accessible scales, electronic height measurement devices, an infant examination table and an infant scale. 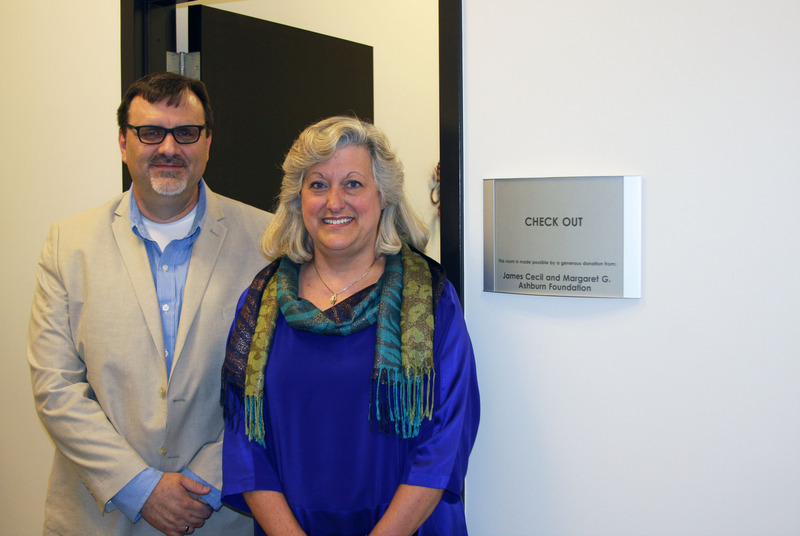 The conference and training room at the Smith Family Clinic for Genomic Medicine has been named in honor of Jan Smith, supporter of the HudsonAlpha Foundation and the research being done at HudsonAlpha Institute for Biotechnology. Smith, founder of Huntsville technical solutions company S3, Inc., supports many Huntsville community organizations with her philanthropy. This new gift supports genomic medicine at the Smith Family Clinic. Smith explained her reason for the $250,000 gift to the clinic. 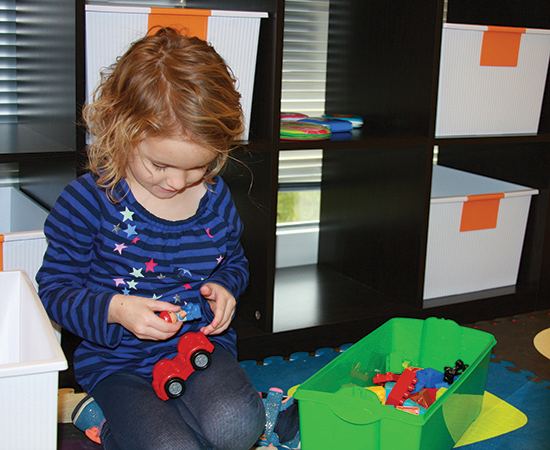 Thank you for support of the playroom in the Smith Family Clinic for Genomic Medicine. If you would like to be part of HudsonAlpha’s future, please visit hudsonalpha.org/naming-opportunities.